In all his learning and teaching, all of his travels, works, words and deeds, Jesus proceeded toward one final act of distinct humaness. In the garden, Jesus wept. 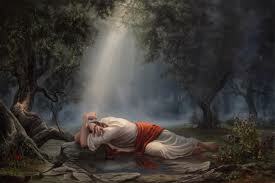 He wept not for himself. He feared neither suffering nor even death, knowing they were, for him, nothing. Rather, he wept for the suffering and death in the world, recognizing that for suffering and death to exist in the world, it was from his mind it had been projected. It was in that deep and sorrowful revelation he begged, “Father, this bitter cup. Let it be taken from me.” Then he went, forgiving his disciples for slumbering, knowing all who slumber will one day awaken. ~ by a.b.johnson on 11/11/2009.